For various reasons, folks like to abandon reason and get creative with their resumes. They might think it will fool hiring managers about their age or work history, or maybe they believe their gimmicks will get them around recruiting software. Well, guess what? It’s not going to work. It’s time to stop fooling around with your resume and stick to the tried and true. According to the article, employers know job seekers use functional resumes to hide gaps in their work history. Funnily enough, this commonly suggested “trick” is little more than a red flag for most employers. Employers are aware of this strategy, too. All it shows them is that you don’t know how to edit your work properly. In order to decide how far back you should, Ireland suggests asking yourself a few questions, including “How old do you want to appear on your resume?” and “How relevant are your earlier positions to your job objective?.” You can read the full list on her blog. 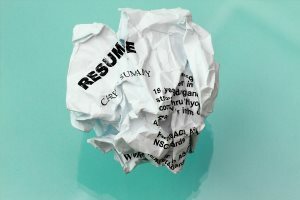 U.S. News & World Report says that a significant number of companies don’t even use resume-screening software — especially smaller companies — so this trick is generally useless. If the company does use resume-screening software, there’s a good chance they’ll find you, even without the barrage of keywords — provided you’re qualified for the position in the first place. U.S. News & World Report says that unusual resume designs “sacrific[e] content for flash.” Hiring managers don’t want flash — they want easily accessible, relevant information. This reminds me of a kid at my college. He put his resumes on grocery bags. His tagline was, “I’m so willing to work for you I would brown-bag it every day.” It seemed clever, but nobody knew exactly what the heck he was talking about. Nobody could figure out what packing your lunch had to do with landing a career.